Three Israeli extremist lawmakers entered the Al-Aqsa Mosque compound on Monday, provoking Muslim devotees, Palestinian media reported. According to Al Ray, the provocative tour came a week after Israeli Prime Minister Benjamin Netanyahu gave permission to his legislators to enter the compound. Amir Ohana and Ehud Glick, from the ruling right-wing Likud Party, and Shiri Muallem, from the extreme right-wing Jewish Home Party, known for their strong racist anti-Arab and anti-Palestinian views, toured the Muslim compound under heavy police supervision. 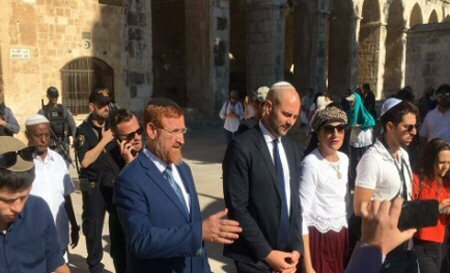 The three, who support the idea of building the Jewish temple on the ruins of Al-Aqsa Mosque, which they advocate its destruction, were accompanied on their provocative tour by hardline Jewish fanatics who share similar thoughts. 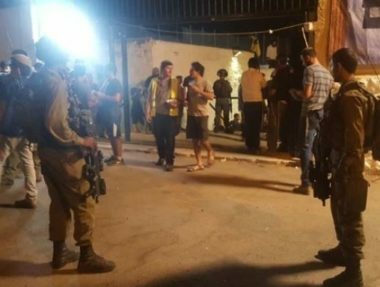 The MKs who entered the compound were Amir Ohana (Likud), Yehuda Glick (Likud) and Cheri Maalam (Jewish Home), according to the PNN. The three are known for their anti-Arab positions, and are supporters of establishing of the alleged temple mount in the place of Al-Aqsa mosque. The lawmakers and their entourage left the compound after completing their tour and taking pictures and recording video, talking about turning the Muslim holy place into a Jewish temple. Another Israeli Likud member and the Israeli Minister of Agriculture entered the compound on Sunday, taking a similar tour of its yards and plaza. The Muslim Awqaf (endowment), which is in charge of Muslim holy places in Jerusalem, has condemned Netanyahu’s decision to allow lawmakers and officials to enter the mosque area, warning that such moves could provoke a religious strife.